The Alma Soprano ICE laser hair removal system offers virtually painless hair removal with the smoothest results and one of the most comfortable applicators on the market. Thanks to Alma’s patented SHR technology, the Soprano ICE hair removal laser utilizes top of the line cooling technology to keep skin cool and comfortable during treatment. The result is a safer, more effective, and considerably less painful laser treatment experience that is perfect for all skin and hair types. The Soprano ICE offers incredible skin cooling through a sapphire-coated applicator tip that provides fast cooling and protection for the skin. The advanced applicator helps trap heat into the deepest layers of the skin during treatment, allowing for faster, more effective destruction of individual hair follicles. It’s a fast and powerful way to permanently get rid of hair while keeping patients cool and comfortable as well. The Alma Soprano ICE isn’t just incredibly effective at providing permanent hair removal, but it also provides a truly pain free experience that patients will appreciate. Unlike other laser hair removal systems that can be painful to patients, only the Alma Soprano ICE provides a virtually painless treatment option, with many patients reporting that it feels as comfortable as a massage! It’s also highly effective at relieving minor muscle strains, stiff joints and general muscle pain, providing just the right amount of heating to reduce inflammation and provide comfortable relief. 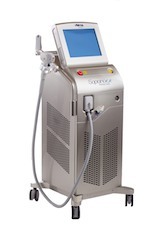 Offering the highest level of comfort and the smoothest results thanks to clinically proven technology, the Alma Soprano ICE laser machine is a smart addition to any cosmetic treatment practice. The hair removal system is a great investment, with no “per treatment” disposables to purchase, and low cost of operation over time. The Soprano ICE was also designed with a fast operating speed and larger spot size for faster patient turnaround, allowing you to perform more spot treatments and even full body treatments in a matter of minutes. Interested in adding a Alma Soprano ICE to your cosmetic treatment practice? SunrayLaser.com has great deals on used Alma Soprano ICE laser equipment with savings that are up to 60% off the original price! See for yourself how much you can save on used laser equipment when you buy from SunrayLaser.com. Looking for pricing information and other details about our selection of pre-owned Alma Soprano ICE laser systems? Please fill out the form below and we’ll provide a fast and free, no obligation quote. It’s an easy and no-risk way to learn more about this outstanding line of hair removal lasers.